thebahamasweekly.com - To the victor goes the spoils; Bahamas promoted to Zone 2 in Davis Cup!! 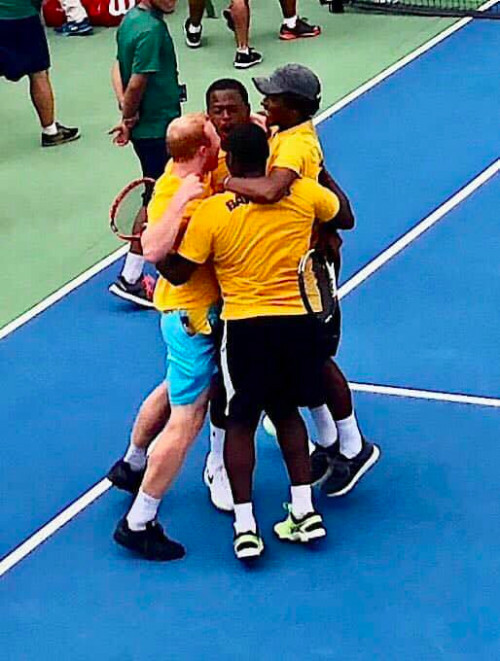 To the victor goes the spoils; Bahamas promoted to Zone 2 in Davis Cup!! The Team showing appreciation to the supporters. Photo courtesy of Ms Fina Johnson. 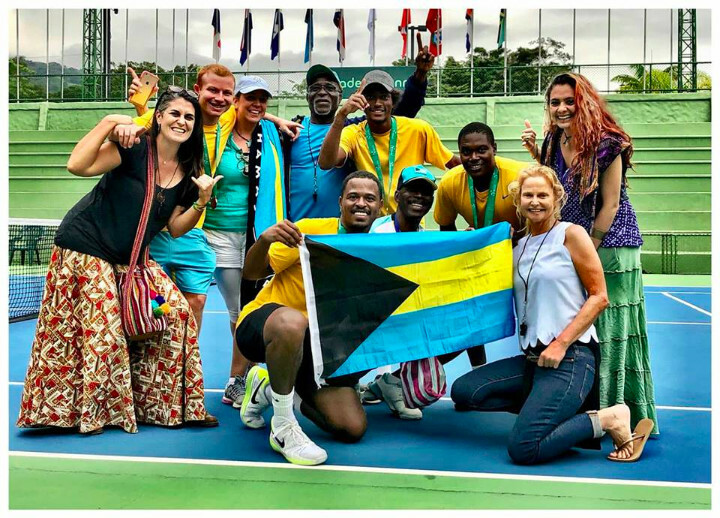 The Bahamas has been promoted once again in Davis Cup Competition after the stellar performance displayed in tournament play by its world class athletes. The Bahamas who presently sits in the The Davis Cup, Americas Zone III in 2018 had just been relegated after playing in Zone II in 2017. Therefore the mission was clear: our guys had to work hard to ensure that The Bahamas would earn the right to enter into Zone 2 competition in 2019. Mission Accomplished! The Bahamas Team came into tournament play today undefeated and at the top of their pool. They played Honduras, Antigua & Barbuda, Jamaica and Bermuda. They were matched against a rowdy hometown crowd in Costa Rica. A supporter who travelled with the team Ms. Fina Johnson described the local crowd as “ruthless” with “a band of musical instruments at their disposable. Undaunted, Philip Major Jr. faced his opponent Sebastian Quiros with a level of finesse and poise. He dispensed with him in no time allowing only 4 games 6-2,6-2. Philip has had a stellar performance in this competition with a 100% win ratio in singles. His focus and drive was evident in his deliberate manipulation and dominance of the competition. Based on his persistent and consistent play he has been dubbed Philip “The Screwdriver” Major because he kept driving the nail of defeat into the competition. Jody Turnquest said that Philip played “a pretty good match”. With his win today Rubber 1 was in the history books for The Bahamas. All for the 242 medals received for Baker,Marvin Philip and Jody. Photo courtesy of Ms Fina Johnson. With the score tied 1-1 the ticket to Zone 2 would only be secured by the country who had was able to get a doubles win! Would The Bahamas be able to pull it off with the dynamic pairing of Marvin Rolle and Philip Major? Philip and Marvin were undefeated in doubles play in Costa Rica thus far and had built a strong chemistry which is very critical when playing together. Marvin who has competed in more Davis Cups than all the other team members combined and with more wins under his belt was ready to shut the door on Costa Rica. The question was asked of The Bahamas, “Will they be able to pull out a win against a rambunctious hometown crowd in Costa Rica?” Costa Rica brought two fresh players to doubles Pablo Nunez and Julio Saborio. The Bahamas had garnered some additional sideline support by this time from other competing countries like Bermuda, Jamaica and even Honduras. The thunderous cloud loomed in the Costa Rican skies and everyone wondered was this a bad omen and for which team? The two Teams Promoted Team Bahamas and Team Honduras. Photo courtesy of Ms Fina Johnson. Jump for Joy Team Bahamas. Photo courtesy of Ms Fina Johnson. 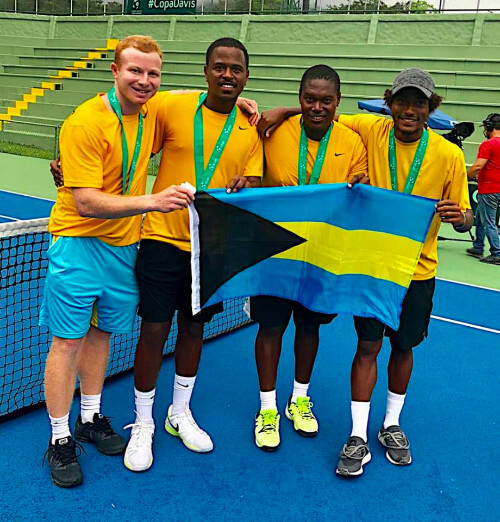 The Bahamas 2018 Davis Cup Team experienced some last minute lineup changes with #1 Spencer Newman and #4 Kevin Major Junior not able to participate in this tournament. The team of Baker,Philip, Jody and Marvin was able to come together create the chemistry and glue to sustain the Bahamas in an undefeated victory in Costa Rica. At the end of tournament play The Bahamas was the only team from 9 countries who sustained a 100% win ratio by defeating all the teams it matched up against including co-winners Honduras. Hats off to our athletes, job well done. The team which consist of second team All-Sec Baker Newman who was the #1 seeded player for The Bahamas. Philip Major Jr. who was on fire throughout the tournament was a strong #2 player provided all the leeway needed as he put the Bahamas in the position to win by winning another singles or doubles. Jody Turnquest who provided major support to the team and was instrumental in getting singles and doubles wins in Costa Rica as a first timer to Davis Cup Competition. Baker and Philip who led the team from the break to the finish line. Jody and Philip have been playing on the pro circuit in Europe and Mexico. Marvin Rolle who has captained this team time and again through the Zones brings the calm and focused affect in the face of any chaos or disturbance. His tennis acumen steered this team through the sometimes choppy and sometimes seemingly calm waters. He knows when to wear the cap of player and when to wear the cap of coach and he wears both admirably. The Bahamas Lawn Tennis Association congratulates the Team of Baker Newman, Philip Major, Jody Turnquest and Marvin Rolle on its superb tournament play and excellent win ratio and salutes Captain Marvin Rolle who steered the team into victorious shores. The heat was turned all the way up and The Bahamas will hopefully continue to burn bright as they head into Zone II in 2019. 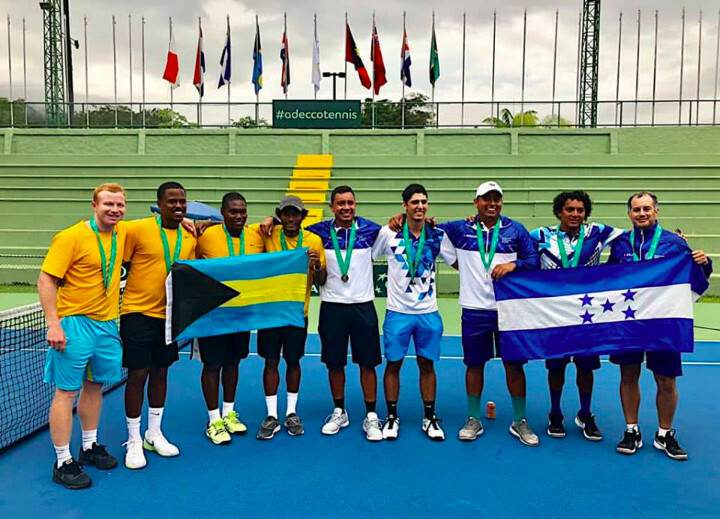 This was a beautiful win for the tennis history books – Bahamas is the 2018 Co-Champion( along with Honduras who defeated Paraguay) of Davis Cup Americas Zone III. The Davis Cup is the premier international team event for men's tennis and is known as the "World Cup of Tennis Over 130 nations compete for the chance to be called the World Champions of Tennis.